If you follow my blog, you know that Rosa is my kindred spirit and ‘sister’ in Spain, whom I will meet two weeks from now. I’ve been busy preparing for my trip to Spain, and while I knew Friday was Rosa’s birthday, I didn’t realize that it was her 60th birthday, or that a big family celebration was planned. Rosa’s milestone birthday party brought up memories for me of my 52nd birthday party (a delayed 50th birthday celebration because of the events surrounding my mother’s passing as referenced in Journeys to Mother Love). Rosa and Pedro attended that celebration via Skype. It was a very emotional day for me. It was my first birthday since my mother passed away. Pedro surprised me that day with the first of his compositions written personally for me, Ardis’ Song. I wept as I read aloud a story I had written about the connection with my Spanish family. 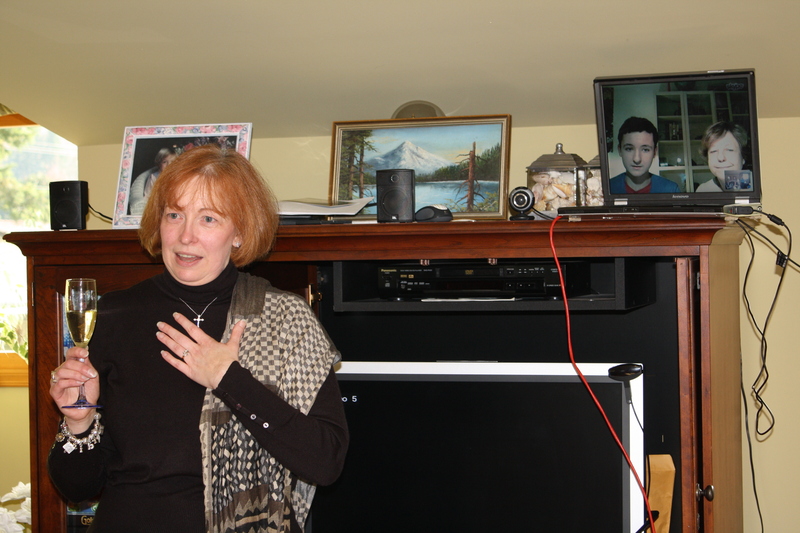 Pedro and Rosa join the birthday celebration via Skype. This story, “The Perfect Gift”, was the first writing assignment I tackled in my memoir class a few months before my birthday. It was the one piece I wanted to have published. To date, “The Perfect Gift” has only been shared at my birthday party and at a few Toastmasters meetings. It is the piece I hope to share in Spain. In honor of Rosa’s birthday, I’ve decided to post this short story on my blog. When you’re done, I’m sure you’ll agree why I consider Rosa my kindred spirit and Sister in Christ, and why I am so excited to meet her. This was the long-awaited day of Pedro’s return to America. Pedro was the foreign exchange student that our family hosted for a month the summer before. Many of the past months were spent preparing for his return to our home. On Pedro’s first night in America he was tired and jetlagged from his day of traveling. He tried to stay up as long as possible to get his body in sync with the 9-hour time zone difference. And of course he didn’t want to break with our tradition of exchanging gifts on his first night in America. Pedro and the family all gathered in the playroom upstairs—just like last year. Each family member opened their gifts from Pedro’s family. I patiently waited as each person opened their gifts. I had secretly plotted with Pedro over the last few months what to get them. I was joyful as I watched each person open their gift and genuinely thank Pedro for his family’s thoughtfulness. I knew as soon as I saw my gift that it would be a special gift—one that would tie our families together but I didn’t know how profoundly God had orchestrated it until later. Our families had been through so much the last year. Rosa, Pedro’s mother, and I both lost our mothers. We had prayed for each other and encouraged each other from across the world—neither one of us speaking the other’s native language but by emailing our communications through an online translator. 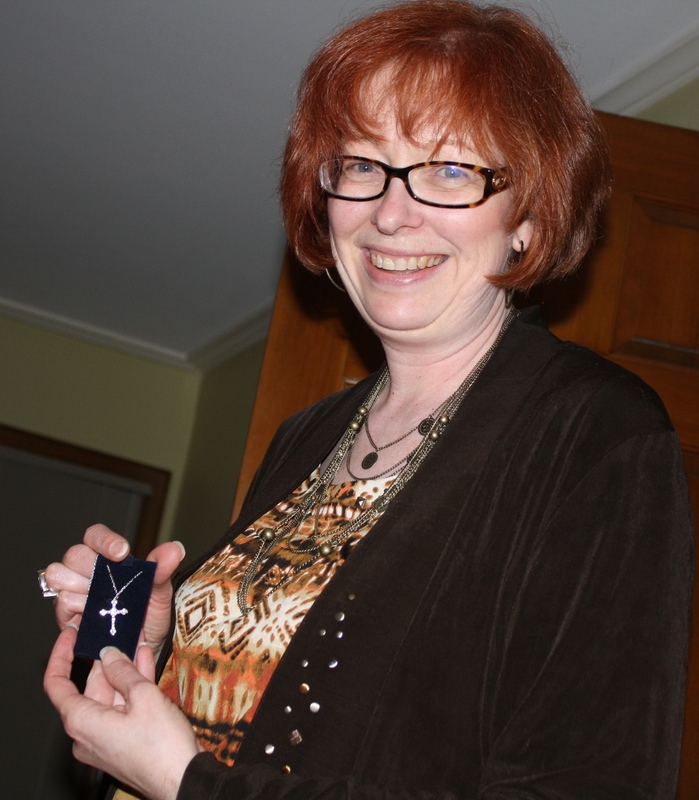 The gift was a sterling silver cross pendant embedded with sparkling Swarovski crystals. As I looked at the cross I knew immediately that Rosa had picked it out just for me. Although Rosa is Catholic and I am Protestant, we both have a strong faith that connects us. During the several month period when our mothers were dying, Rosa and I sent each other encouraging notes and prayers to help each other through the painful process of watching and waiting for the inevitable to happen. The cross was a beautiful reminder of how God had brought us together and how our mothers were both at peace as a result of our friendship. The next morning as I got dressed and put on the cross, the first wave of its significance hit me. My thoughts raced back to a visit with my mother in November 2009. That was my first visit after my mother’s stroke—a stroke that left her partially paralyzed and virtually unable to communicate. The timing of that trip had been so painstakingly planned as to not interfere with my previous commitments. I was volunteering to serve at a ministry function and then one week later was my 50th birthday party. I sandwiched the visit between the two events. Days before the ministry event my mother had taken a turn for the worst and I feared that I would not make it back home to see her alive. But my mother miraculously recovered and I was able to complete my ministry obligations. On the plane ride to St. Louis I couldn’t help but think about what to expect over the next few days. What state would my mother be in? Would I be able to handle all of the medical decisions that needed to be made? Would I be able to emotionally handle seeing my mother after all these years? I prayed and prayed for God’s guidance and strength to carry me through those next few days. I recalled how God had abundantly answered my prayers on that trip. I remembered how after I arrived at my mother’s bedside that God gave me absolute peace about being there and compassion in serving and loving on my mother. One of those first loving acts was to give my mother the cross pendant that I received for my first communion. I had treasured that cross for over forty years. It was a special gift from my Aunt Ardis who was also my Godmother. My intention was to just let my mother borrow the necklace until I returned home. I knew I’d never be able to physically part with it. I also knew that even leaving it on my mother’s neck for the few days while I was there might lead to it getting stolen. I had learned long ago to never give my mother anything of value because it would always mysteriously disappear from her room at the nursing home. When the time came to leave, I made the painful decision to stay a few days longer. There was just too much to do and I couldn’t bear the thought of leaving my mother. It was just too soon. I knew that staying with my mother meant cancelling my 50th birthday party. It also meant that I would be spending my 50th birthday away from my family and friends. As I prayed over my decision, God gave me more peace. My birthday party seemed like a selfish consideration in light of what my mother was going through. I knew it would be the best thing to do. 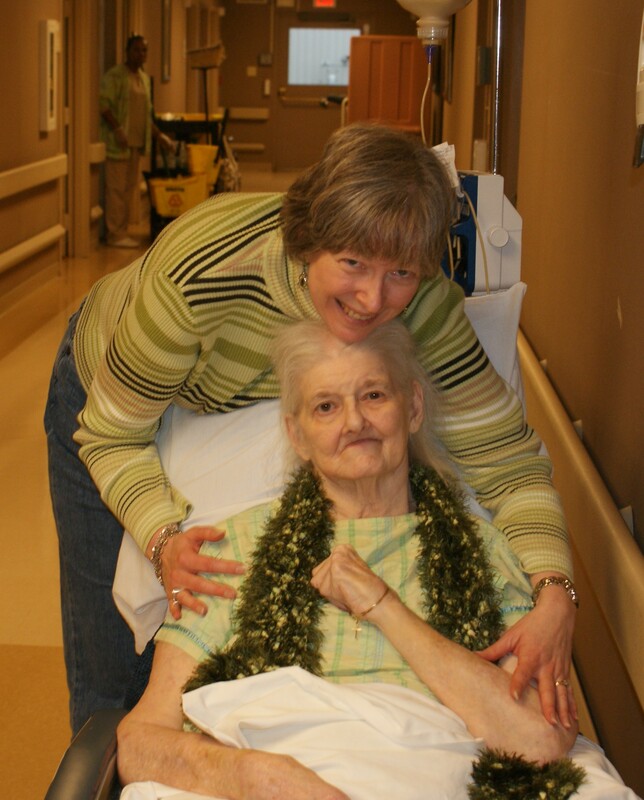 I spent my 50th birthday at my mother’s bedside. I made the final arrangements for the hospice care to start. I met with the chaplain. I fed my mother, bought her flowers, read to her and massaged her feet. It was a very bittersweet day. I couldn’t help but think about how my mother brought me into the world and cared for me as a baby and now I was doing the same for my mother. Mom holding my first communion cross. Every day that I was with my mother I would put the pendant around her neck. Then at the end of the day, I would take it off again. I didn’t feel comfortable leaving it on her overnight. Then came the final good-byes. It was the evening of my 50th birthday. I felt God pulling on my heart and telling me to let go of the necklace—to leave it with my mother. After the events of the last ten days, it seemed silly to even think of keeping it for myself. So my last act of love for my mother was to give her that cross pendant. As painful as it was, I told my mother that was my promise to see her again. I prayed that God would honor that request. That was the last time I saw that pendant. Thankfully it was not the last time I saw my mother alive though. So as I put this new pendant around my neck—the cross I received from Pedro’s family the night before—I felt God telling me that He was rewarding me for sacrificing that first communion cross for my mother. I knew that God had replaced it with one that would have new meaning and special memories attached with it. I was overwhelmed with joy at this new revelation. I couldn’t wait to tell Pedro. I couldn’t wait to tell Rosa. While Rosa and I had journeyed together over the last few months as we prepared to bury our mothers, Pedro’s family did not know anything about my giving away my cross. I truly felt kissed by God. I was grateful for this tangible gift of His love and how He orchestrated these events. Almost two weeks had passed since I had received the cross from Pedro’s family. My family along with Pedro, were now vacationing in central Oregon. So much had been going on since Pedro’s arrival that I didn’t have an opportunity to Skype with Rosa and personally thank her for her gift. Pedro would Skype with his parents every few days, but each time I didn’t want to interfere with his family time. But on this day, I had pre-arranged with Pedro to have some Skype time with Rosa. Pedro and I sat on the deck of the condo with his ipad revealing video images of his parents 5,300 miles away in Madrid. I was, of course, wearing the cross that day—as I had almost every day since I received it. Rosa immediately made mention of it by pointing to my neck. I didn’t need Pedro to translate that reference, but he did anyway. I thanked Rosa for the necklace. Before I could start to relay the story about my first communion cross, Rosa began to tell Pedro the significance of the cross to her and why she picked it out as a gift. Pedro translated her story to me. Pedro explained that Rosa’s mother had given her a similar necklace for her 50th birthday. I was astonished. I looked at Pedro with surprise in my eyes. “Did you tell your mother the story about the cross?” I asked him. “No, no, I didn’t,” he said. I couldn’t believe my ears. It only took an instant for that to sink in. I grew more excited about her gift and about telling Rosa about the connection. Pedro knew the story, so I told him to relay the story to his mother in Spanish. I smiled as I clasped the cross in my right hand. Again, I was recounting all the events of the last year that had happened between us—the miracles that God performed in the passing of our mothers, our friendship across the world and now this simple yet miraculous connection between us. The cross was a reminder of our love for each other, our love for our mothers and our love for God. This cross really was the perfect gift. As we continued on with our skype talking about the sightseeing we had done and the activities of the last few days, I couldn’t help but remember the verse that God had given me each time He gave me one of these special moments to relish. It was Luke 2:19, “But Mary treasured up all these things and pondered them in her heart.” That was exactly what I was doing. 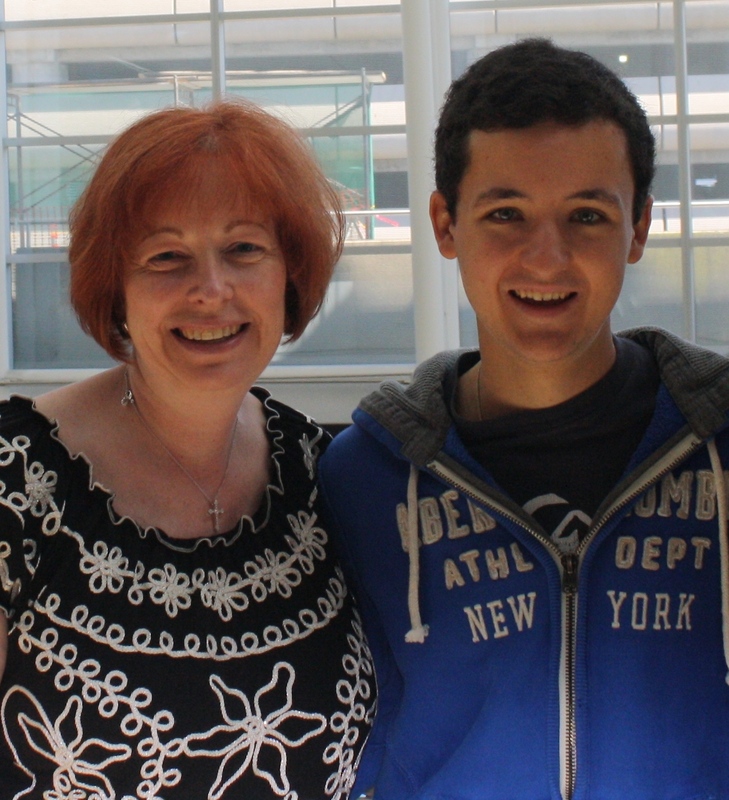 Airport goodbyes, July 2011, the last time we physically (not virtually) saw Pedro. This piece went on to birth the manuscript for “Walking My Mother Home.” In fact, the women at my 52nd birthday party prayed over me that day and anointed my writing. The manuscript was written and submitted one week later. And the rest, as they say, is history. For me, this story is still unfolding. It’s a lot to keep up with on top of my own family commitments and American relationships. But this I know for sure, God has anointed this Spanish connection from the start and the next part of the story is just beginning.